Petite 4 x 2 x 4" Jewel 6.5 x 3.5 x 6.5" Cub 8 x 4 x 10" Medium 13 x 5 x 10" Filly 12 x 5 x 12" Vogue 16 x 6 x 12" Wine 4.5 x 4.5 x 13"
Vogue size Hot Pink Laminated Gift Bags by the 10-Pack. Call our Custom Print Dept. to personalize these bags with your store name or logo at 1-800-547-9727 ext. 4. 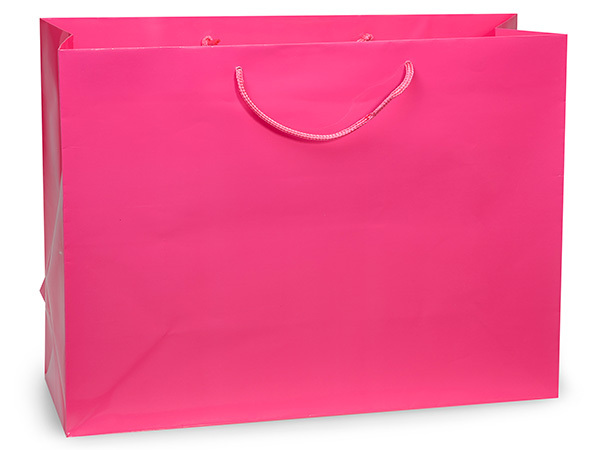 Deluxe Gloss Color Laminated Paper Gift Bags are made of heavyweight 150 gsm laminated paper, with cardboard bottom inserts, and coordinating cord handles.